Ep has been a bit fiddly to manage since Ep regeneration have been depending on how much food you have at the moment. At first I thought that made it more interesting to decide when to eat. However, I notice that I personally find the micromanaging and optimization of Ep-regeneration to be more frustrating than fun, and the choices to make are actually not that interesting. I also feel that the necessity of the “you can still use 3 Ep and be fully recovered” to just be stressful. In v2.5 Ep regeneration will work just like hp and mp regeneration: you are always fully recovered on rest. Ep-regeneration is no longer depending on food. This is also a buff for the player which I think is ok since Ep has been a very scarce resource. In addition the warning mentioned above is replaced by a warning that reminds you to identify things in your inventory if you can before resting, since that is now always the right thing to do. The reason the warning was not there before was that with the complex Ep regeneration there were cases where waiting with identification might have been better (e.g. you needed full regeneration in order to identify an enchanted item). The game will now always prompt you before committing a “cruel” act that would give you aggravation. If you accidently would include a neutral or unconscious monster in a burst-spell, the game will prompt you. This should prevent accidently attacking unconscious or neutral monsters. Another annoyance regarding unconscious monsters has been slightly improved. You no longer have to pay Ep to push an unconscious monster.The original purpose of the Ep-cost was to discourage pushing around unconscious monsters to corners etc. This is now instead discouraged by having a small risk that the monster wakes up if you push it. If it wakes up, it gets an attack of opportunity on you. This means that it is still dangerous to push monsters, but an unconscious monster stuck in a corridor is much less of a problem now. The “view discovered items” menu now show you all known places of the item you are looking at. This can help if you remember seeing an item but forgot where, or if you don’t remember which NPC that sold a certain item. If the item has been used up, stolen by aliens, destroyed or otherwise not available, it will just say “unknown”. 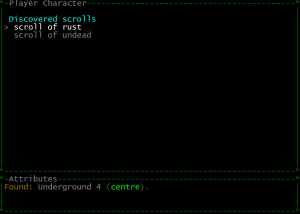 A scroll of rust can be found in the centre of underground 4. Campfires no longer go out when you bump them if you have nothing to cook. This means that you don’t have to check your inventory before bumping it. A fire can still go out, but only directly after you grill an item. Similarly, grindstones can no longer break items. Instead every use costs 2 Ep. The EP Regeneration simplification is super cool. And View Discovered Items is actually impressive. You got us hyped with those recent posts!! Yes, I was finding the EP management a bit annoying, great to see all this new work being done on the game! Yeah, I think it’s much better this way with the Ep, hope you’ll like it too! Just a random question: is there any penalty to break a tool when you are confused? You mean if it is a higher risk to break a tool when you’re confused? No, the risk is always the same (although some things have a higher chance to break than others). 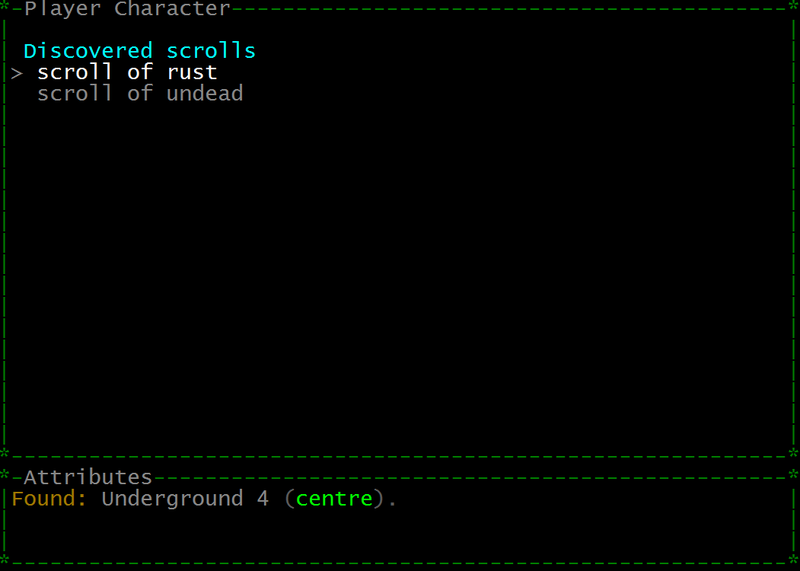 I’ve significantly reduced the prices to enchant stuff on expensive things in the next versions. However, I have not done many changes to the actual random enchantments you can get. Yeah, sometimes im sure if it is a good idea to use a pickaxe for example when im confused. but then it is! thanks! A small QoL improvement I’d like to see: Can x try to avoid targeting unconscious monsters? I end up getting aggravating unintentionally sometimes because I’m trying to finish off a fleeing monster with rocks, and target an unconscious one instead. I would make it so that pressing x tries to target any conscious monsters in view, and only if that fails will it target an unconscious ones. Manually switching targets would be unchanged, of course. First, I think the new prompting will completely solve the problem of accidently attacking unconscious monsters. Still, your suggestion may make targeting smoother in general and would be fairly straightforward to implement, so I may experiment with it!